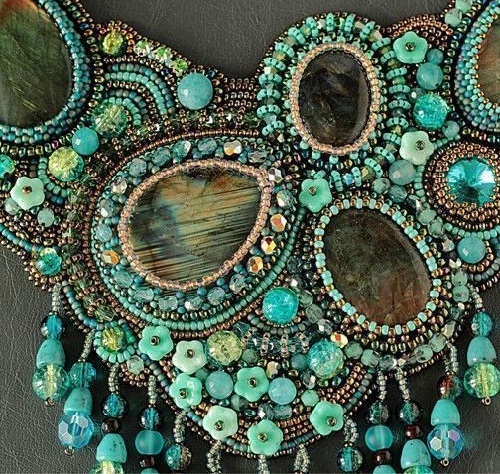 Necklace ‘Peacock’ is truly the royal necklace. Made of beads and natural stones – labradorite and amazonite, Swarovski crystals, Czech glass beads, quartz beads. 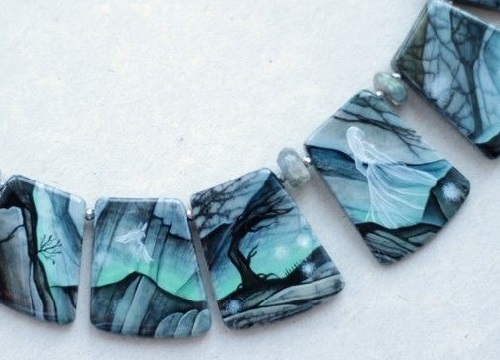 The necklace shimmers and changes colors depending on the light. 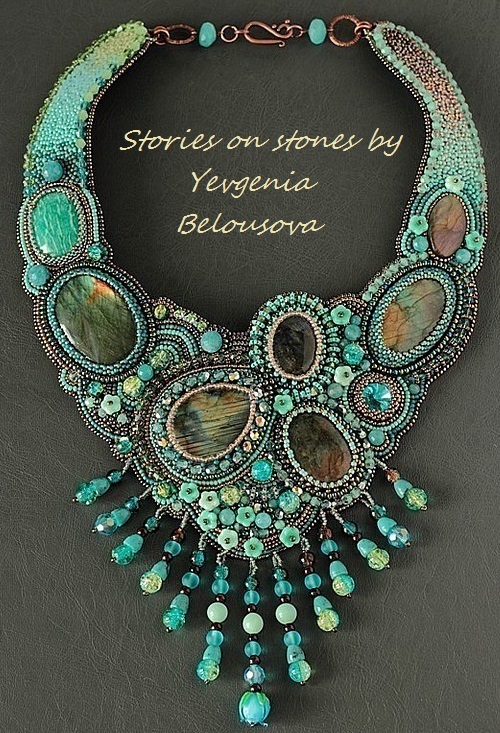 Russian craftswoman, jeweler and a graphic designer by education, Yevgeniya Belousova lives and works in the Siberian city of Barnaul. 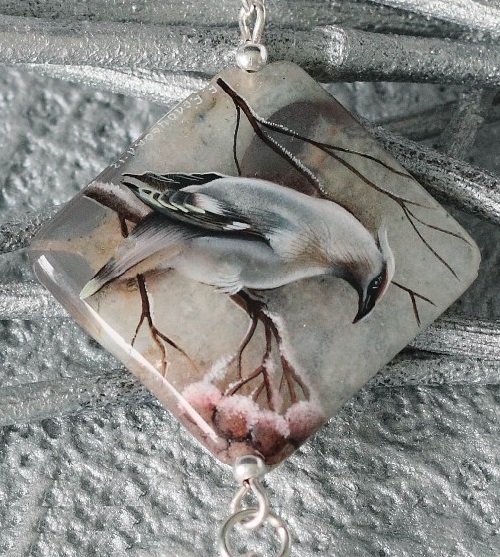 Jewellery and painting is her hobby and profession at the same time. 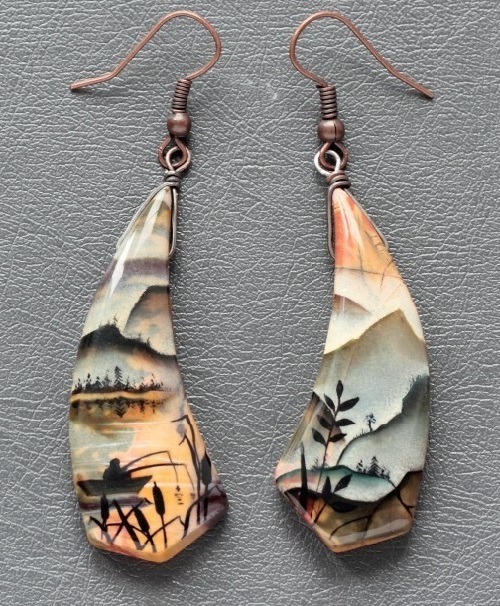 She has been painting on cabochons and designing jewelry of natural stones, beads and polymer clay. Stones – a living material, work with which is very exciting. Most of all she loves to discover a story in a stone, carefully researching it. 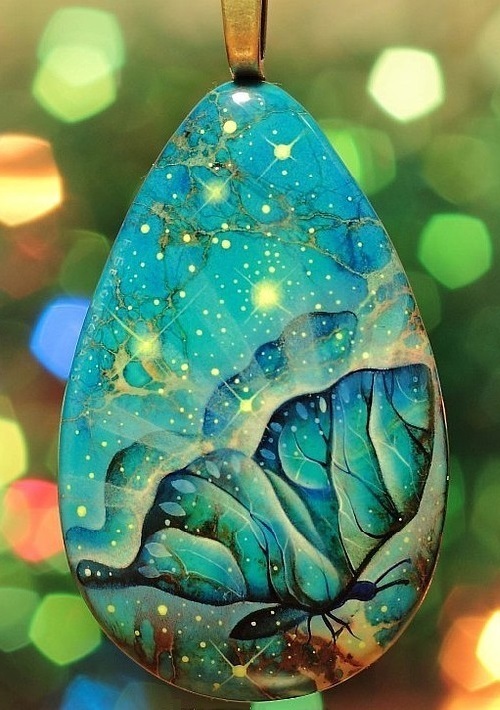 Every stone has its own story, each ornament is not similar to other, and the task of an artist to see it. 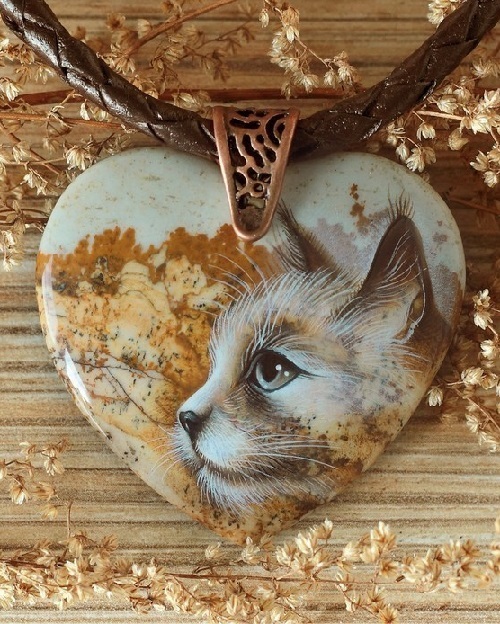 Painting on stones, she tries to show their essence. No less interesting is to emphasize the design and create a story for painting. 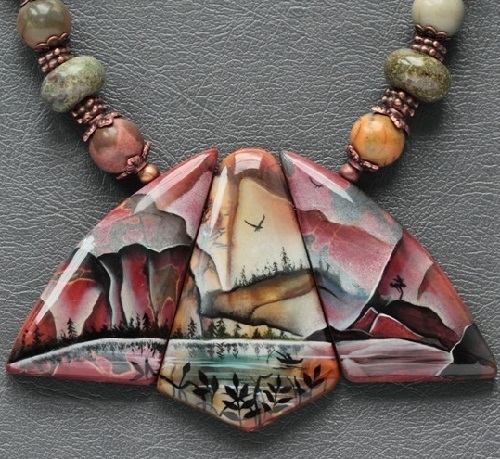 Painting on stones, Yevgeniya Belousova is most attracted by the opportunity to breathe new meaning into the piece of mineral, searching and finding amazing images in the natural lines. Stones – a special material, each cabochon requires deeply individual approach, and to work with every stone as if to work for the first time. She loves to experiment and combine different techniques, so constantly looks at other areas of creativity and explores something new for herself. Yevgeniya Belousova has been engaged in decoration design since 2010. And since then, she is a permanent member of the local fairs and exhibitions in the city of Barnaul. According to Yevgenia Belousova, she strives for continuous improvement and internal development, because without movement there is no progress. 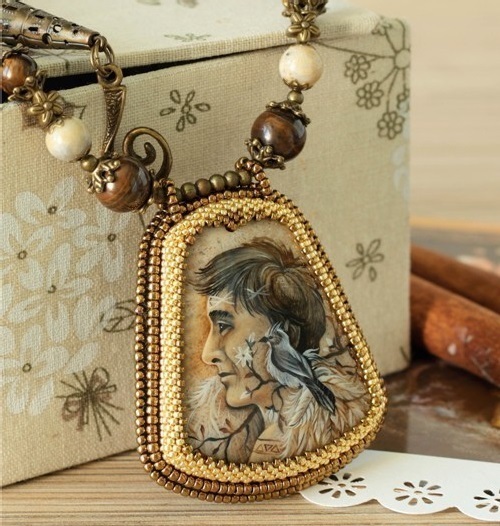 Necklace with painted Ghost World (lacquer miniature). 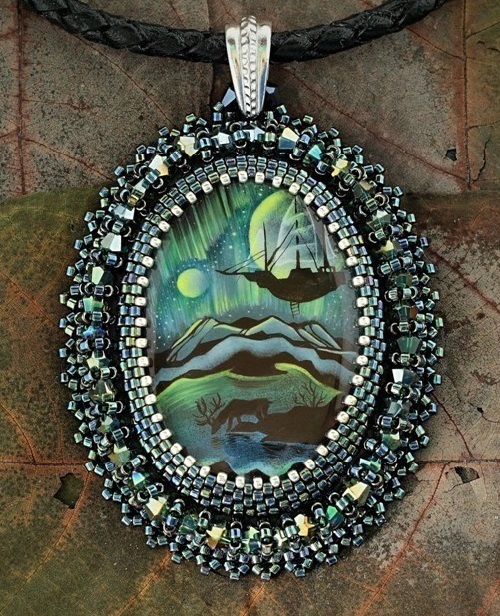 Big Necklace of Larvikit (kind of labradorite) with a variation on the painting “The Phantom of the gray mountains.” Every of 15 stones is hand painted. 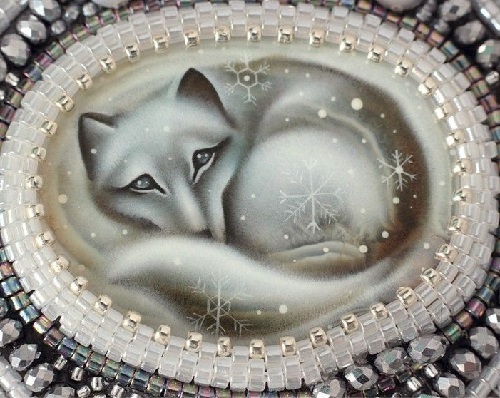 Necklace with painted Snow Fox (lacquer miniature). The painting on agate cut with oil, coated with a protective varnish, sanded and polished. Agate cabochons, pearls, Czech glass, Swarovski crystals, labradorite, bead cord made of genuine leather. 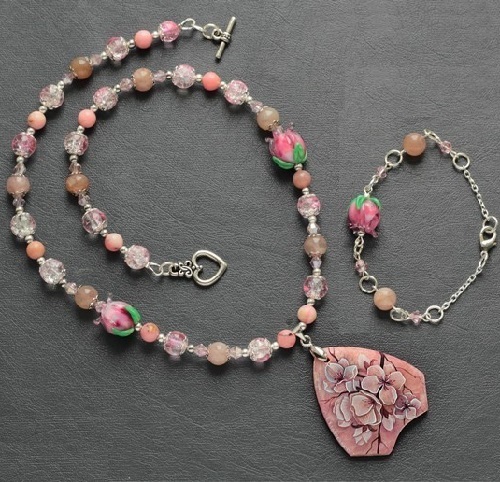 Necklace embroidered with precious Japanese Delica and Miyuki beads. The first day of winter. 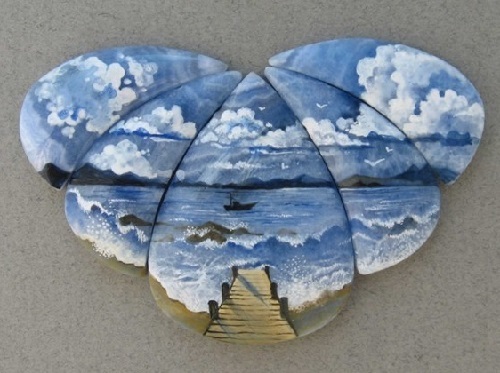 The painting is made on quartz and coated with a protective varnish. 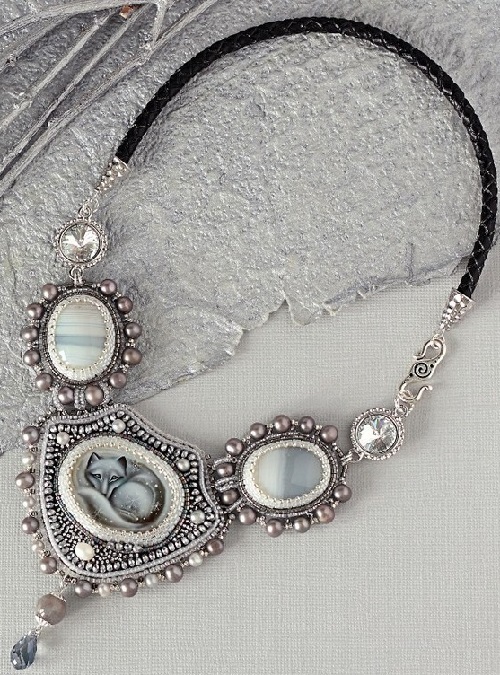 The suspension is assembled on cable from the jewelry labradorite beads, Botswana agate, Czech glass and metal accessories. Short is night for a man, long – for the beast. Night – hunting and speed time of excitement and energy. At night, people are visitors in the wood. Be respectful to its masters, if you want to survive until morning. Guardian of the Night bypasses his possessions, the guardian of the night shall convene a howling pack. He sees your shelter and smells you, but be respectful – and the flock will pass by. Do not break branches in vain, and do not trample the grass, burn fire no more than necessary, and do not make noise. The Guardian of the Night will thank you for your modesty: in the morning you will find three gems on a stump at the edge of the woods. Throw one stone into the water, the other – into the fire, the third – take with you. It will take care of you, keep from troubles, and your way will be easy. 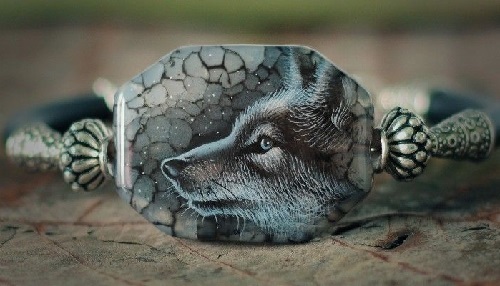 Painting on agate, both sides of bracelet coated with a protective varnish, sanded and polished. In the bracelet are used only the best quality accessories – silver 925 and Tierra Cast (coated with silver 999). 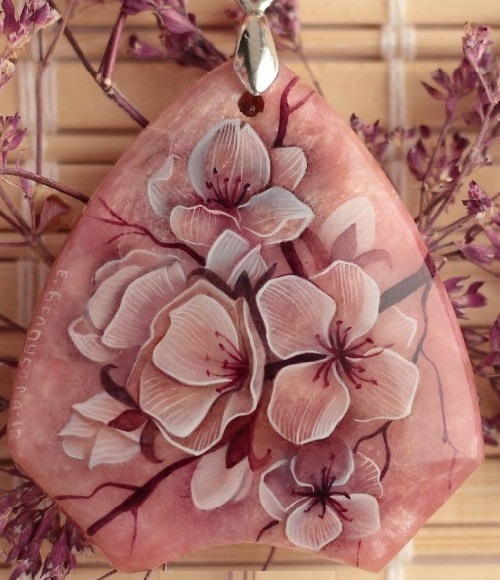 The painting on the pendant is made in the fossilized coral and covered with durable protective lacquer. Stone pendant is decorated in gold and bronze, Japanese beads with resistant coating. Suspension for the pendant is made up of petrified coral beads and iridescent tiger eye on the jewelry wire. 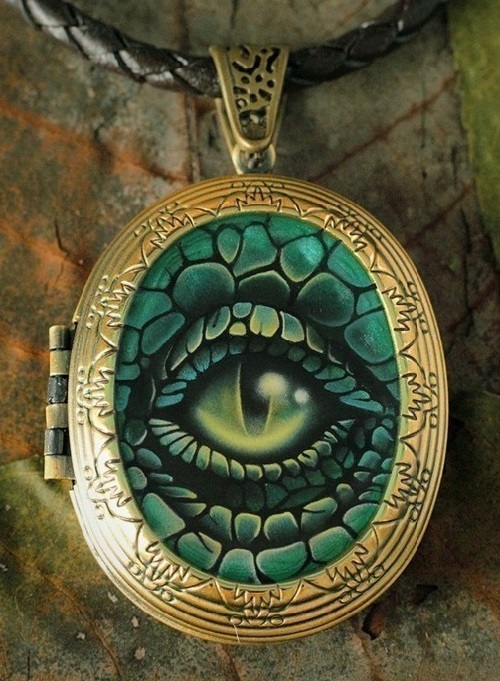 Pendant-painted medallion with ‘Keeper of Secrets’ (dragon eye). The painting is made of metal covered with oil paints and protective varnish. Decorated with beads, agate and zoisite. Over the gloomy mountains, over cold rivers, over deep gorges, over ice-bound spaces, through the storms and blizzards, throw the light of the Northern Lights, they fly – balloonists. And one of them, who will be a coward, will disappear in unknown lands, ignominiously lost. But those who suffer needle sharp winds, six months of darkness and the eternal cold – will return home as heroes. 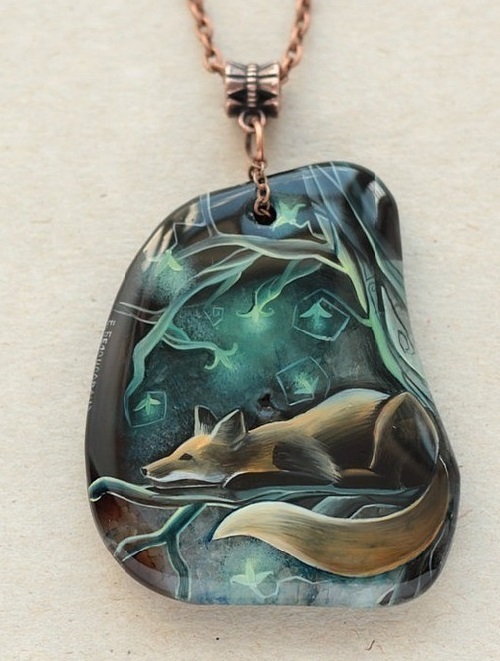 Painting in agate pendant made on oil-based paints, coated with a protective varnish, sanded and polished, making lacquer surface perfectly smooth. 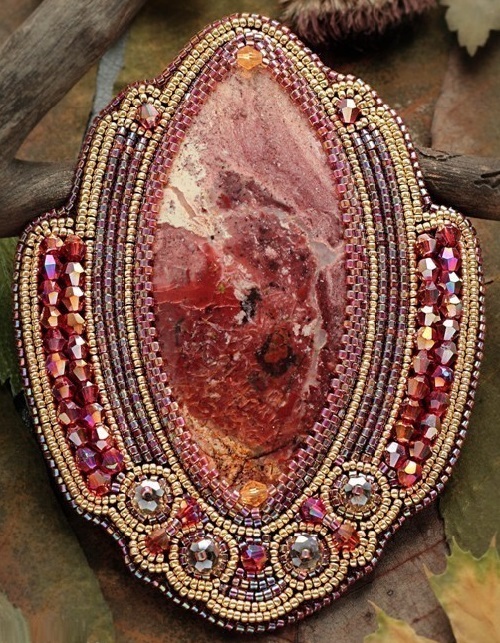 The stone is decorated with Japanese precious beads – Delica – and Swarovski crystals. 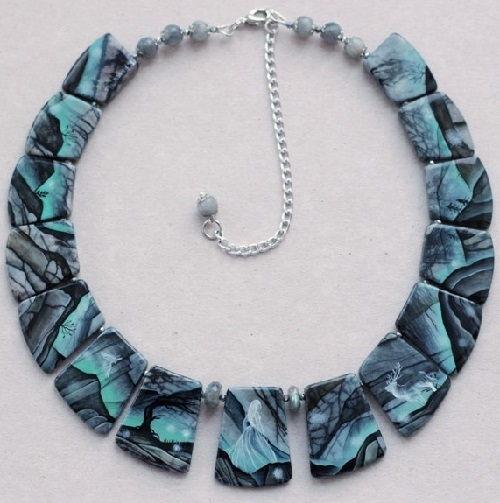 Color beads – hematite (ie, black and gray) with a metallic sheen, but in different light beads begin to “play” shades of muted emerald, aqua, bluish, gray-blue. Mountains – an inexhaustible source of inspiration, a symbol of greatness, real “place of power”. The steep slopes, soft alpine meadows, vast sky, snow-capped peaks – it’s all they are.